No I did'nt hear from your sister Frieda as yet. Note your bakery Friend is moving from your neighborhood - I think you're better off, but I guess the birds will miss their desert.! We have had it very cold here too recently, snow in some sections, looks like California is losing it prestige - suddenly its turned quite hot again, just like mid summer. We also had a lot of rain which of course was very welcome. Yes, drinks were served at our friend's house on New Year, I had a small one just to join in the Toast to '62. We left shortly after so do'nt know if anyone got shikkered or not. Did the Dr check the nose trouble Jack?, not being able to breathe through it must be very discomforting, maybe a pinch of snuff occasionally might help clear it, but ask your doctor first to be sure its not harmful - I would suggest of course to ease up on the smoking business, but I know thats pretty difficult - I was very fortunate that I lost all desire for cigarettes a year ago last Labor Day, I was a chain smoker, 3 to four packs a day, a miracle that I quit without any effort - strange is'nt it.? Nothing much exciting to tell you, so Eda joins in kind thoughts & every good wish to you all. Thanks for the Valentine greeting card - so sorry my taking so long to acknowledge your Xmas Day letter, I've intended to do so several times but I guess I've got that Manana complex - have so much unanswered mail, am really ashamed. Anyway, rest assured Betty, I am not offended - your letter in fact was most interesting reminiscing & describing your lonely Xmas days in boarding school when you were a little girl - it was really touching - having experienced that boarding school routine myself as a kid I know just how lonesome you felt - I spent most of my early days in boarding school due to my folks being theatrical - I can only remember two or three times the Family being altogether at home & then for very short periods. I appreciated your using the large type, it helps a lot - incidently, no improvement in the eye trouble, I doubt if I'll ever regain my full vision - frankly, do [not] care much, it does'nt bother me any. We sure have had a miserable time here with the heavy rains, floods & landslides - unfortunately several lives lost & lots of property damage - you probably, know all about it. Not much exciting to tell you Betty - Eda Joins in love & best to Wayne & yourself. Thanks yours, 31st.ult. Glad you recd. the book OK.
Hope my last letter reached you by now - as I told you, you omitted your Street & number in your previous letter & I took a chance the P.O. would know where Albany Apt Bldg. was located. Any if by chance it is returned to me I'll re-address it to you. 1. The shots of all the Twins in the same scene in "Our Relations" was actually two of us working in front of a scene shown on a screen, with the other two in action behind us - the screen behind us showing the picture of the other two is of course made first then projected from the rear of a screen & re-photographed again from the front in which the same two characters work - its simple, but a little difficult to explain - the scenes at the Docks however were double exposure shots, could'nt use the screen method in this particular location. 2. The "Chump at Oxford" film was made entirely at the studio, the cast were mostly English & resided in Hollywood. 3. No I never did work in any films without Mr Hardy during the time we were teamed, he appeared in about three films without me. 4. I had no particular favorite films, some I did'nt care too much for - some I liked, such as "Blockheads" "Way out West" "Fra Diavalo" "Toyland" etc. re my favorite comics, I liked Chaplin, Harry Langdon, Buster Keaton, 'Fatty' Arbuckle, many of them in that Era. Yes I knew the late Will Rogers very well - as you know he mode a series of short films at the Roach Studio during our time there, a wonderful person.! No, do'nt see many of the old-timers - many of them have passed on of course, Charles Middleton you mention died several years ago - I know Bert Wheeler very well - friends for many years, we still correspond occasionally. I only spent one week each time I played in Winnipeg - Yes I used to do quite a lot of Marlin fishing, had a nice boat in those days, specially equipped for 'Big Game' fishing - caught many Marlin, my largest was 258 lbs - I was a member of the famous Tuna Club at Avalon, Santa Catalina Island - wish I were able to take n cruise once in a while - do'nt have my boat anymore & too my health situation is'nt too good. I was horn in Ulverston, Lancashire, England, June l6th. 1890. Ulverston is near the famous Lake Windermere, you may have heard of it. The weather here is getting quite hot again - had lots of rain, fog & cold recently, even some snow in many sections, so unusual for us out here. Am enclosing a snapshot taken last summer - hove none in Color. Thanks for snapshot of flood scene (1950) must have been quite a shower.! Amazing how this ‘Twist’ nonsense caught on—it’s actually nothing new in the dance category. Thanks yours with enclosure of N.Y. Views - have just mailed the latter to my Sister in England, I know she will enjoy & find very interesting. We have been having some miserable weather here too - heavy rains for about two weeks which have caused great damage to many homes & unfortunately several lives lost - Floods & land slides etc. cars stuck in mud up to door handles - hope this does'nt change your mind in moving out here.!! The weather cleared for a couple of [days], but a new rain storm started last night - I imagine this will be the last of it. Interesting to know you plan to come West later on. Do'nt blame you for wanting to get away from that severe winter climate. However, I would suggest you take a trip out here for a couple or more weeks & look around before you make a final decision. I called the Santa Monica Chamber of Commerce & requested they send you their current literature, they promised right away - if anything else I can do - please do'nt hesitate to let me know. I heard, that 'Peppermint Lounge' was just a 'JOINT' - amazing how this 'TWIST' nonsense caught on, its actually nothing new in the Dance category, borders on several of the old time Dance routines	the 'Shimmy' etc. Anyway, the craze will die out like the others before them - frankly I could'nt care less. I autographed [the] page from the book & am enclosing it herewith - again thanks Edmund. My kind thoughts to you all. “Peppermint Twist” is a song recorded and released by Joey Dee and the Starliters in 1961. Capitalizing on the Twist dance craze and the nightclub in which Dee performed (“The Peppermint Lounge”), the song hit number one on the U.S. Billboard Hot 100 in early 1962. Ironically, “Peppermint Twist” replaced Chubby Checker’s “The Twist,” the song that sparked the Twist craze, at the number one position. Thanks Bob & Marie [Hatfield] for belated Valentine greetings. Note you will be spending a few days here - we shall look forward to seeing you both again, in case you forgot our phone, its EXbrook 3-5656. Eda joins in kidn thoughts. P.S. Our best to your Mother.! Herewith cheque covering rental of 1111,Franklin St. which Eda & I have endorsed for deposit. I heard about the wax figures of Laurel and Hardy to be placed in the Hollywood Museum a couple of years ago. Note my old friend Charlie Althoff appeared on Chuck McCann's show recently - I have'nt seen him since he worked in that old silent film in '26. He was playing in vaudeville at that time & happened to have a week lay off (between dates) so I was able to arrange a few days in the film I was making to fill in. Charlie did a great vaudeville act, a very funny 'Rube' character, he was known as a 'Show Stopper'. I would enjoy hearing the tape you mention & will return it to you. Regarding the 'Still' pictures; Chuck McCann did send me two or three Blow Ups a few weeks ago (118x20) but none of the ones you mention. Do'nt bother to send me any more - I have no particular use for them. Re your idea of a L&H record album is already being discussed by Larry Harmon - he controls all rights to anything in the merchandising line that concerns L&H, so of course, this matter would have to be conveyed to Mr Harmon direct. Interesting to know that Henry Calvin was doing Hardy's voice - I had heard that he was going to audition, but did'nt know that he had been chosen for the job - you seem to know a great deal about whats going on here - I guess I'll have to keep in close touch with you to get any information on the series.! Sorry too that Chuck did'nt make connection with Harmon - only wish I could have helped in some way. Have heard nothing further on the L&H Lake placque, do'nt know what happened to that. Guess thats about all for now, so Adios mi Amigo. Cheerio, Pip Pip & Skip the Gutter. P.S. I heard about the Wax Figures of L&H to be placed in the Hollywood Museum a couple of years ago - some chap in Long Beach had been commissioned to make them, he called me re my height & measurements & I sent him photos of Hardy & I, but never heard from him since. 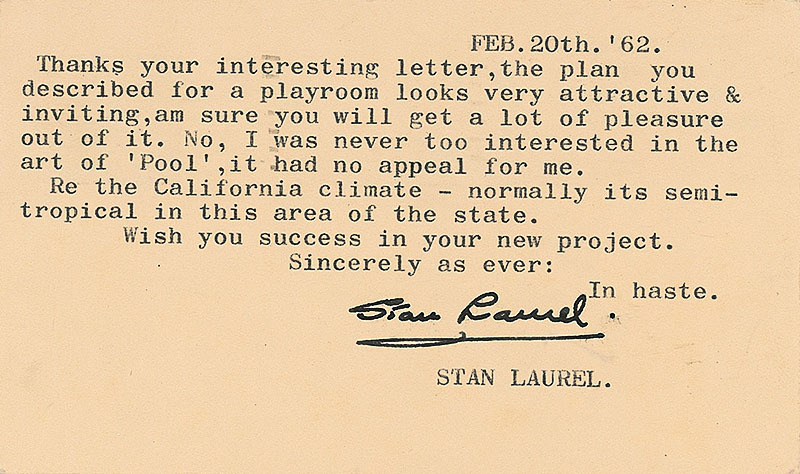 Thanks [George Coleman] your interesting letter, the plan you described for a playroom looks very attractive & inviting, am sure you will get a lot of pleasure out of it. No, I was never too interested in the art of 'Pool', it had no appeal for me. Re the California climate - normally its semi-tropical in this area of the state. Wish you success in your new project. Pleased to know the old L&H films are still affording you so much pleasure. Note your interest in collecting 8mm film prints - I suggest you contact the Blackhawk Film Co, Main Street, Davenport, Iowa. They will send you a catalogue listing on request, they carry as good selection of L&H films, & I understand you get a brand new print on each individual order - I think they operate their own Lab on the premises. With pleasure I am enclosing you an autographed picture - thank you for your kind request. The title of our last film was "Utopia" made in France in 1950-51. I doubt if this is available in 8mm or 16mm. However, I would'nt recommend this one in any dimension - VERY POOR.! Donna P. Witte and Merlin Michael Witte, who have entered into a lease with you for the promises at 1111 Franklin Street, Santa Monica, for a period of one year, commencing November 13th, 1961, and ending November 13th, 1962, desire hereby to sub-let the above premises the	13th day of March, 1962, to the end of the term, said sub-lease to be to Mr. and Mrs. Bill W. Rhodes, and we understand and agree that your permission to such sub-lease shall in no wise diminish or change our liability under said lease for and during said period in the event said Mr. and Mrs. Rhodes fail in any obligation thereunder during the balance of said term ending November 13th, 1962. We have agreed, however, that, as the original lease provided for a rental of $275.00 per month, the payment by Mr, and Mrs. Rhodes of $250.00 per month will discharge the obligation of $275.00 per month so long as said Mr. and Mrs. Bill W. Rhodes perform each and all of the obligations under said lease, and also discharge and pay for the water and the gardener upon the property, and have the gardening and watering properly and punctually done. The undersigned, Bill W. Rhodes and Mrs. Bill W. Rhodes, acknowledge that they are familiar with all of the terms of the lease above referred to, and agree that they will perform same punctually and fully and, further, the lessors hereunder grant to them an option for an additional period of one year commencing the 13th day of November, 1962, and ending the 12th day of November, 1963, provided said option is exercised in writing on or before the 13th day of September, 1962, and all of the terms and conditions of the lease and the sub-lease for the term, thereof from said Mr. and Mrs. Witte to them are promptly, punctually and fully performed and Mr. and Mrs. Rhodes are not in default as to any terms and conditions of the lease, and have likewise had all of the gardening upon said property fully and properly performed as to all of the gardening needs, inclusive of the watering thereof, and have paid all of the water charges and have seemed the obligations of supplying a gardener and discharging the water bills heretofore the obligation of Mr. and Mrs. Laurel. Said Bill W. Rhodes and Mrs. Bill W. Rhodes agree to be bound by all of the terms and conditions of said loam, of November 13th, 1961, as though they had been the original lessees under said lease.